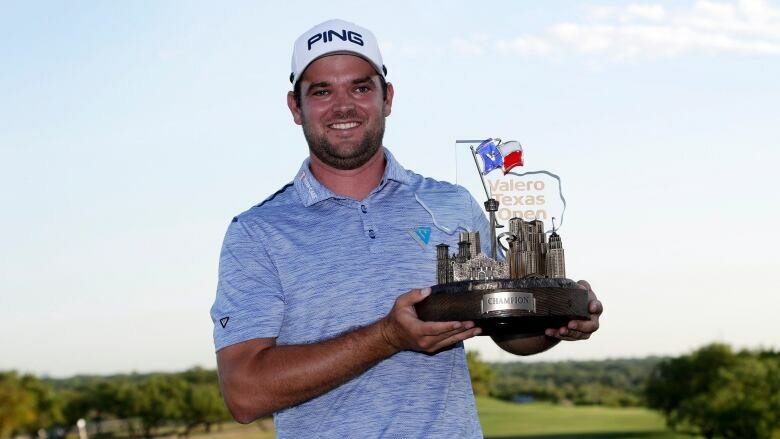 Corey Conners of Listowel, Ont., overcame the adversity of blowing a four-stroke lead to win his first career PGA Tour tournament, at the Valero Texas Open in San Antonio. With the victory, he also qualifies for the Masters, which begins on Thursday. His first PGA Tour victory in the bag and his ticket punched for next week's Masters, Corey Conners' primary concern was a big change to his work weeks going forward. "No more Monday qualifying," Conners said. "That's the best deal from this. Amazing. It's a dream come true. I won't be as stressful on Mondays." Conners, from Listowel, Ont., won the Valero Texas Open on Sunday less than a week after qualifying, earning him the final available slot in the Masters. Conners only entered the tournament field Monday, and he's the first golfer to win on the PGA Tour after qualifying on a Monday in nine years. Next stop for Conners: Augusta, Georgia, for next week's Masters, where he will join 2003 winner Mike Weir as the only other Canadian in the field. "My wife got an email this morning letting her know we could check in for our flight back home," Conners said. "I told her, 'Aw, don't check in yet. Maybe we can make other plans.' Big change of plans. It was going to be an off week. I'm glad it won't be." "I definitely feel like I got good work done heading into next week," Fowler said. "I'm feeling good." It was a wild round for Conners, a Canadian who had not won on any of the PGA Tour's affiliated circuits — he had finishes of second and third earlier this season. He had 10 birdies and four pars that sandwiched four consecutive bogeys on the front nine. "After the middle of the front nine, I thought, 'All right, this is going to be my tournament to win,"' Hoffman said. "He showed up and balled up. My hat's off to him." "I told myself I could do it," Conners said. "I had been hitting a lot of quality shots. I was really relaxed. I had a lot of confidence in my game."